Murano at Portofino South Beach Condos for Sale in South Pointe. 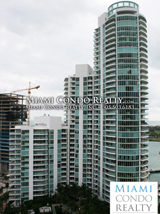 South Beach Waterfront Condos overlooking Government Cut and Biscayne Bay presented by Miami Condo Realty. Unit Sizes: 1008 to 4784 sq. ft. Private bayside Beach and Yacht Club [La Piaggia Beach Club] featuring a saltwater pool and restaurant. Membership included in maintenance fee.